In this three-day workshop we will look at the methods medieval illuminators (also called limners) used to produce the jewel-like pictures that decorated medieval book pages. Included will be instruction in methods used in preparation, under-drawing, gilding (using real gold leaf) and painting these miniature works of art. We'll be using some modern materials for convenience sake, but the results will be similar to the medieval exemplars. 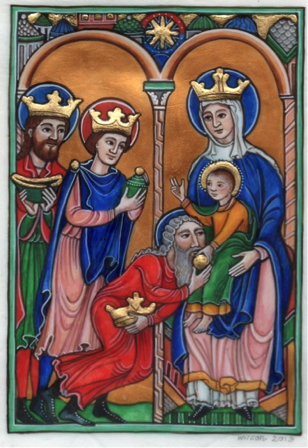 Topics we will be looking at include the 3 Magi, Nativity and Annunciation in the Romanesque style. Exemplars will be provided, but participants can bring their own images if they desire. We will be working no larger than 4 x 6". The workshop will focus on the Romanesque style of illuminations which were produced during the 12th Century. Well known examples of this style include the Winchester Bible and the St. Alban’s Psalter. Debbie Thompson Wilson has a BA in Fine Arts and works as a freelance calligrapher and illustrator, specializing in painting medieval style miniatures. She has been exhibiting this style of work for close to 20 years and has been teaching illumination and gilding techniques across Canada for several years. She lives in Guelph, Ontario. You can find images of her work on the website www.guelphstudiotour.ca (click on her name). To register click please use the workshop registration form. Registration opens on May 15th. A supply list will be provided to all confirmed registrants.